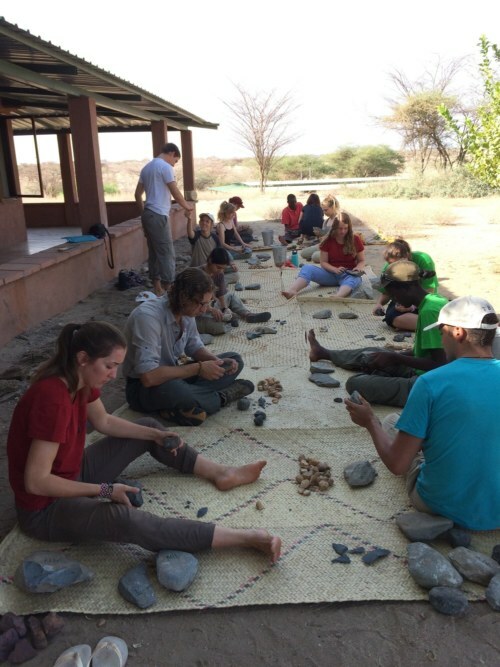 After returning to TBI from an exciting camping trip, we spent the afternoon relaxing and knapping! 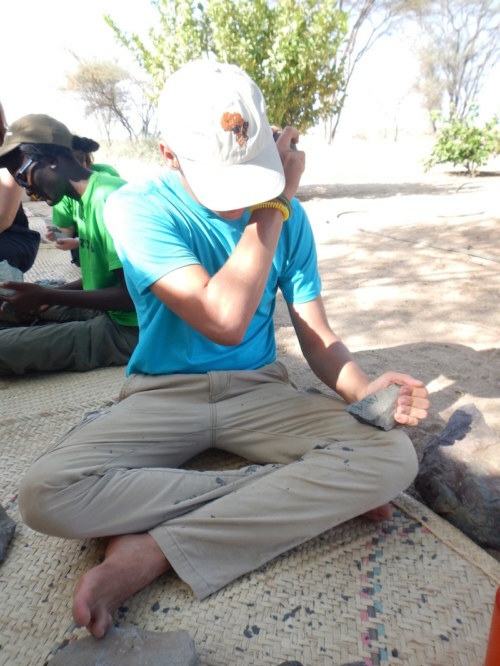 We used the raw material we had collected in the field: though everyone put their initials on the material collected, some students decided to share what they had collected (our students were so thoughtful, but whatever happened to survival of the fittest?). Because we had a plethora of phonolite and limited rhyolite, Dr. 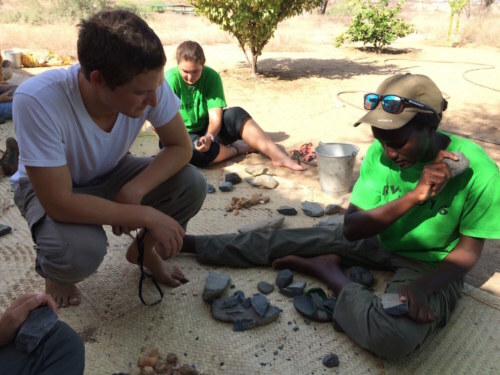 Professor Harmand instructed the students to start with phonolite while they were “perfecting” their knapping skills. 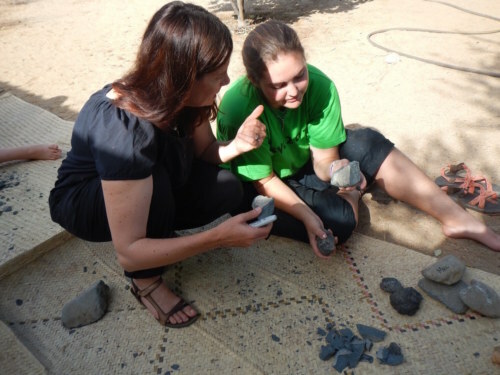 Phonolite (so named because of the clear metallic sound it produces when struck) can be a very good knapping material if it is fine-grained, and because phonolite cores can be rather large, allows for a large learning curve. If you look closely, you can see small shards of phonolite in the air from Tobias’ strike! Max rears back for his tangential strike. Great hat Max! Dr. 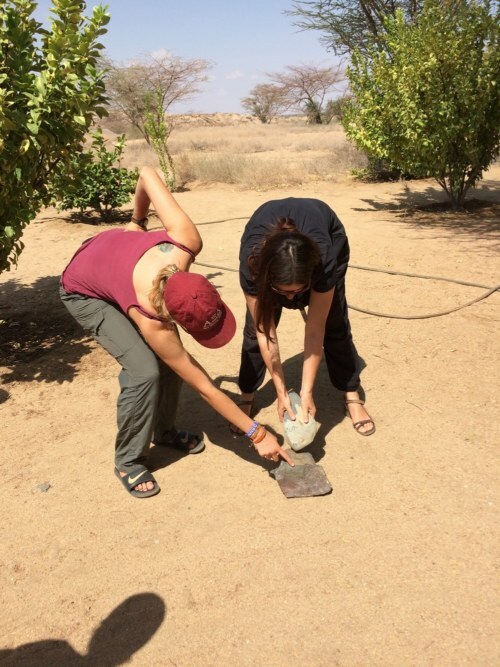 Professor Harmand discusses where to strike this core with Morgan. Emily’s TBI hat helps focus her for a successful strike. Great strike Danielle! You can see the fragments flying through the air. Tobias (picture above) and Kathryn admire their collections! TA Mattia helps Esther perfect her strike motion. 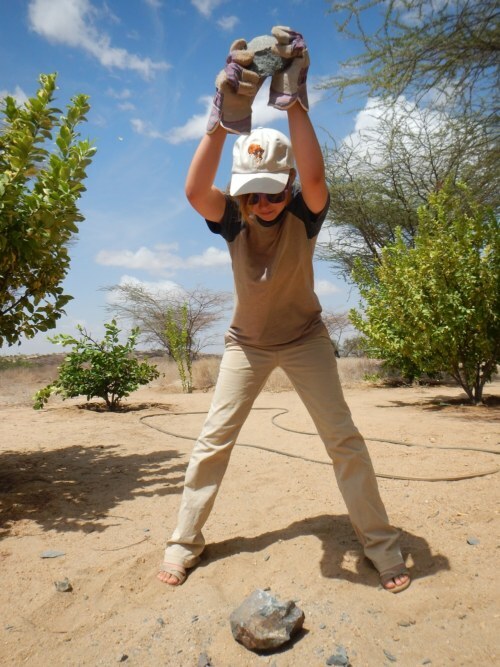 Yvette did a great job trying to make her first handax! 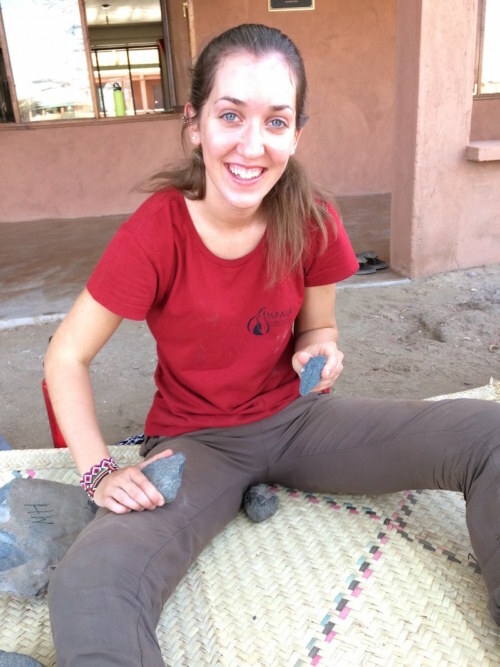 TA Jayde is ecstatic about knapping! 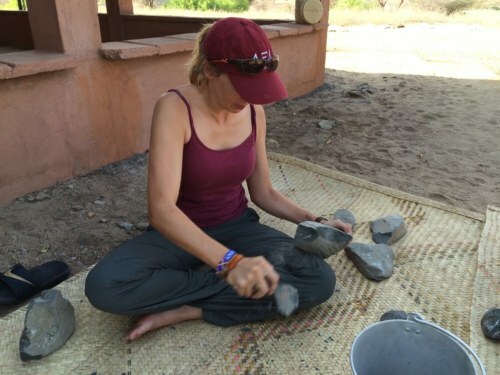 The students started using the direct percussion technique, but throughout the day, Dr. Professor Harmand helped instruct them in using other techniques to overcome problems presented by their cores. The students tried both passive and bipolar techniques! 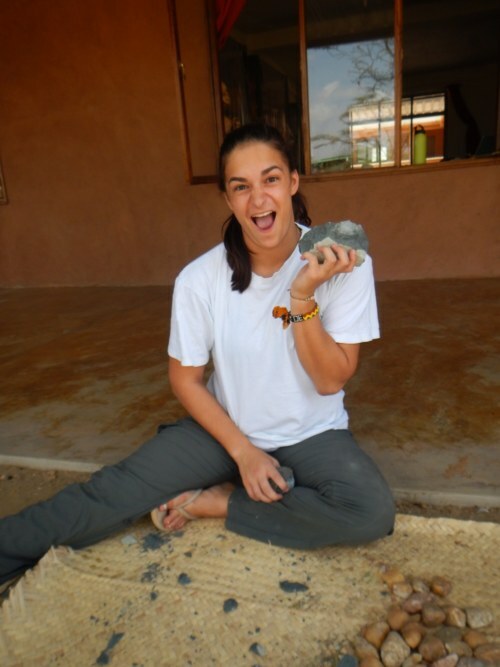 and Danielle learned well, as you can see from the large fragments flying through the air! Emily puts her whole body in this passive strike! 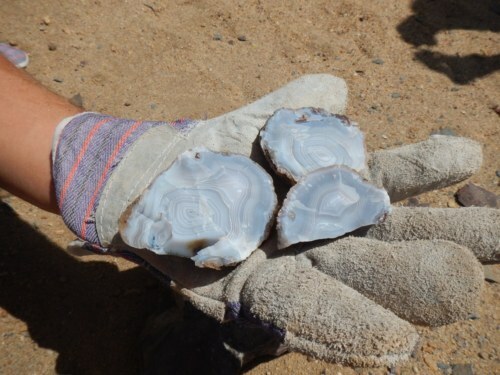 Jon tries out the bipolar technique to split open this chalcedony. 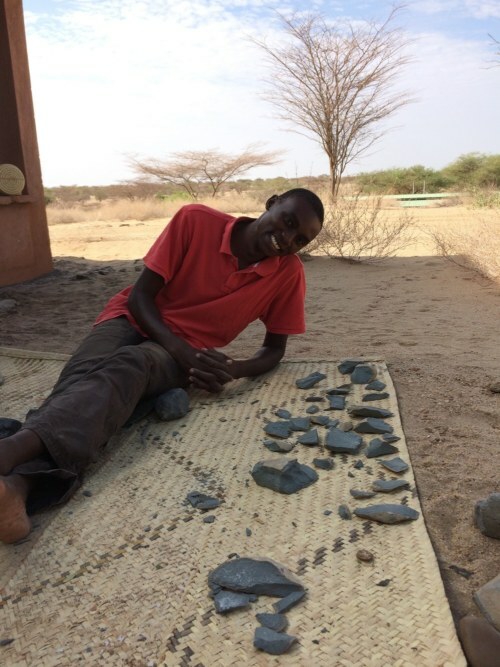 After thoroughly working through the phonolite, the students were finally ready to move on to other materials. 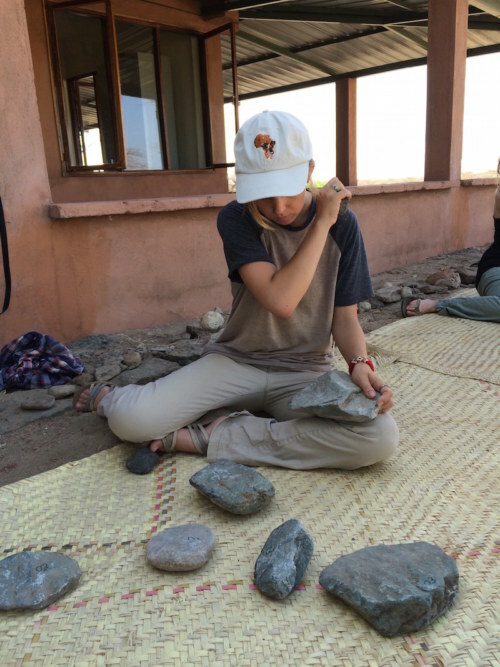 Most students tried knapping rhyolite and others tested out material like cryptocrystalline. 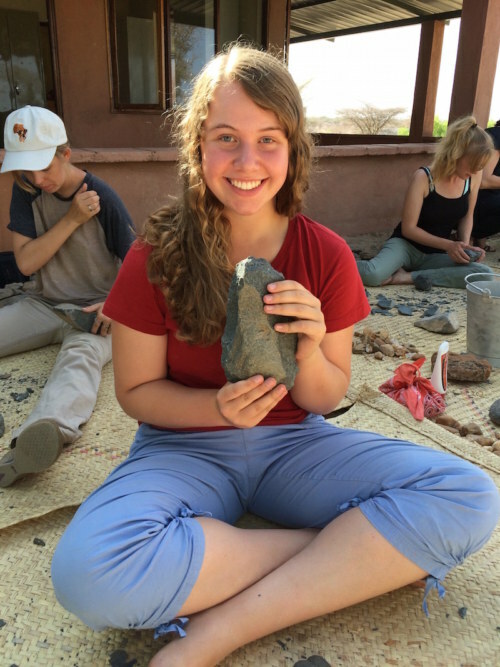 Though it was met with limited success and joy, depending on the cores the students used (some were very small and not-so-fine grained), it was important to understand the fracture patterns of different raw materials! 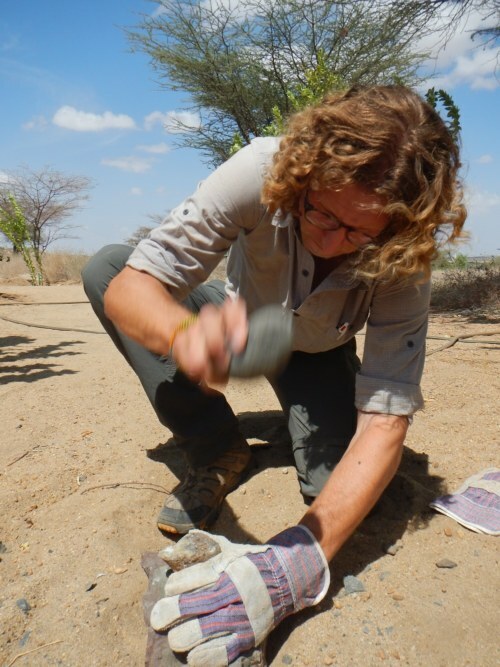 Kathryn knaps a small rhyolite core. The beautiful internal structure of chalcedony! 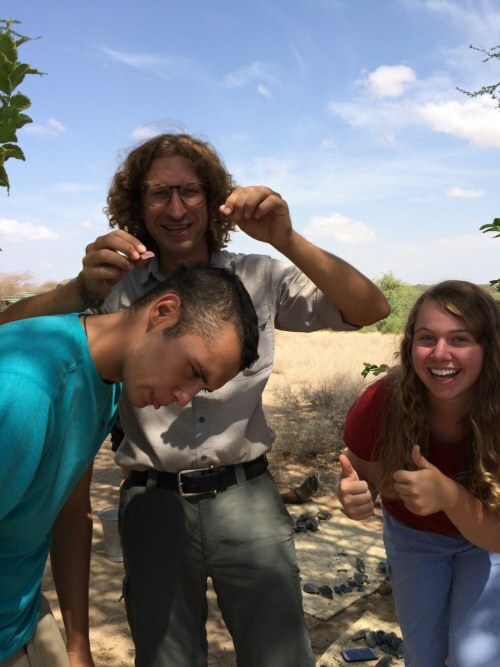 This rhyolite flake was so sharp it could cut Max’s hair! 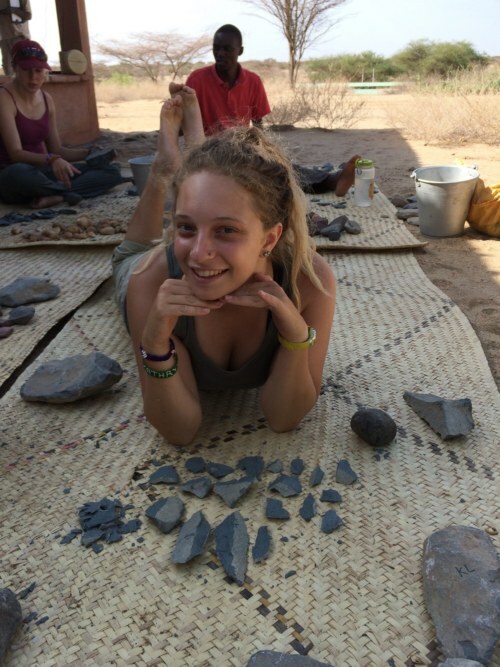 After spending most the of the morning knapping (these students could really sleep the day away if we let em! ), the students chose their best flakes to use for the skinning of the goat that afternoon. 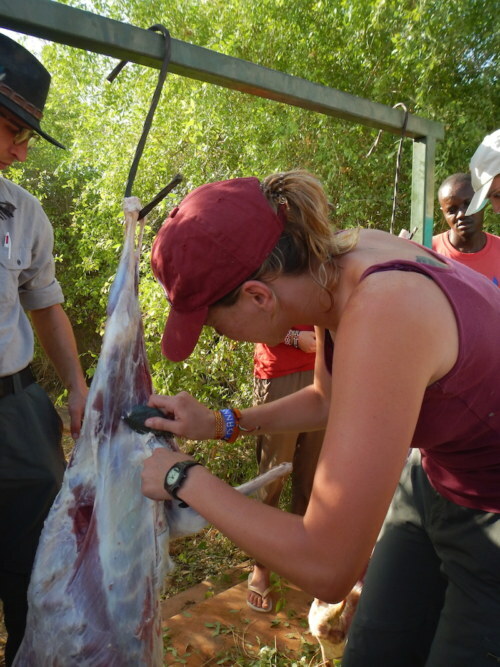 The goats were killed before we arrived so that the procedure was less gruesome and focused on academic. The purpose of the activity is to fully understand both the cognitive requirements as well as the difficulty of the task. 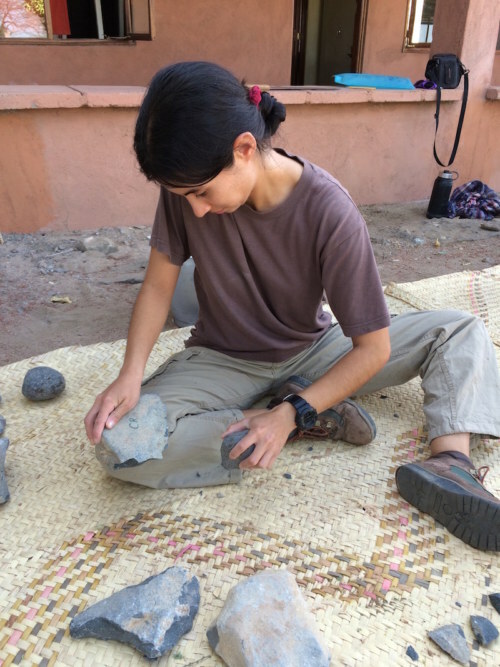 Our ancestors would have had to skin and butcher wild animals in order to procure meat, and though it often seems rather straightforward, doing so with stone tools is much more difficult than one may imagine! 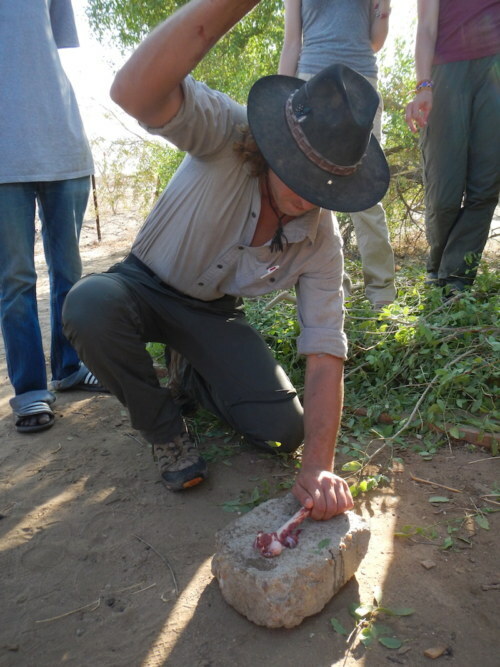 Below are pictures of the goat skinning. Warning: some of the content is graphic. Danielle uses her phonolite flake to cut the meat! 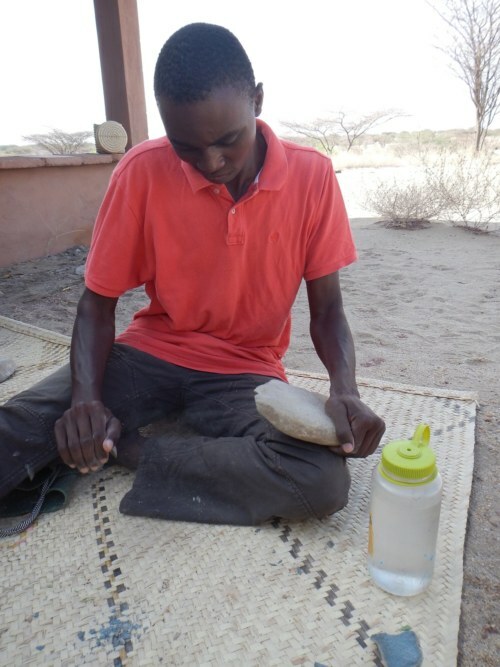 Jon uses a hammerstone and anvil to crack open a bone and eat the marrow from inside!